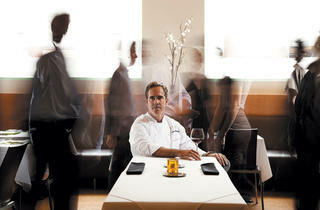 Shawn McClain prepares to put a decade-long partnership and celebrated restaurant behind him. Shawn McClain, 43, has temporarily forgotten about the iced coffee in front of him. He acknowledges he’s taking the conversation on a tangent. 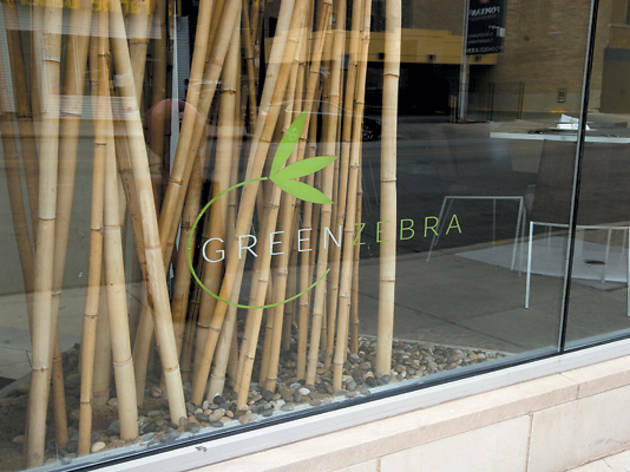 McClain owns half of three Chicago restaurants: Spring, Green Zebra and Custom House Tavern. He’s the executive chef of the first two. Sue Kim-Drohomyrecky and her husband, Peter Drohomyrecky, own the other half of all three and operate the latter, where they recently brought on their third chef this summer. The parties have not spoken in six months. McClain and Kim-Drohomyrecky met when he was the chef and she the maître d’ at Trio restaurant in Evanston, where the pair followed Rick Tramonto and preceded Grant Achatz under the mentorship of owner Henry Adaniya. 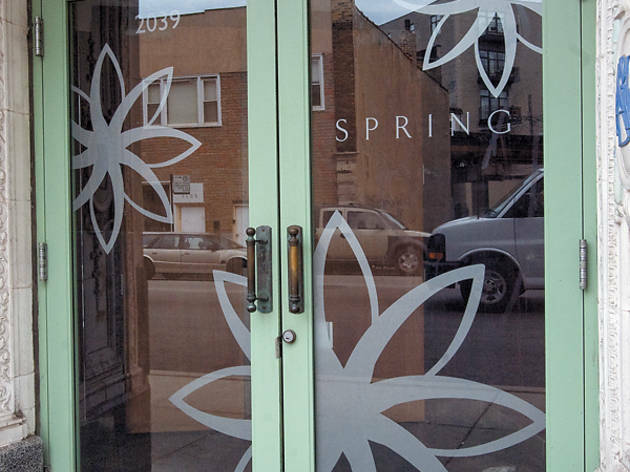 A rising star at Trio, McClain developed his style and earned a following (in 1998 he was named Cosmopolitan magazine’s Bachelor of the Month) that helped him, Kim-Drohomyrecky and Drohomyrecky open Spring in a former bathhouse in Wicker Park in 2001. (At the time, “it was Blackbird, mk, Naha and Spring,” Drohomyrecky says. “That was it.”) The Asian-inflected seafood restaurant opened to instant and enduring acclaim both locally and nationally: That same year, McClain was named Esquire’s “Chef of the Year” for evoking a “refined, unfussy approach with a purity of idea and attention to detail that shows just how passé much of Chicago’s culinary pretensions have become.” The group followed up in 2004 with Green Zebra, a small-plates vegetarian restaurant in West Town, then opened Custom House, a contemporary steakhouse, in Printers Row in 2005. The small empire began to show signs of distress in 2008. Since October 2009, Custom House Tavern has been operated exclusively by Kim-Drohomyrecky and Drohomyrecky, while McClain has overseen the other two restaurants. 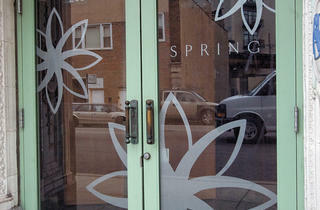 In May 2010, the three partners agreed to sell Spring. 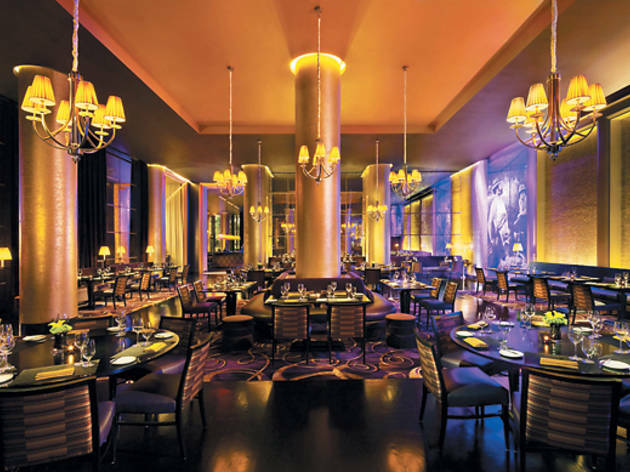 Meanwhile, McClain has devoted much of the last year to opening Sage, a plum-colored restaurant in the Aria hotel in Las Vegas. McClain points to the economic fallout as the catalyst for the split; Kim-Drohomyrecky says, “It’s business, and it’s personal.” One major “bone of contention,” according to McClain and others in the industry, was the Custom House Tavern operators’ reaction to the decision of Richard Camarota—then chef de cuisine at the pre-“Tavern” Custom House—to leave his post to open Sage in Las Vegas. “Nobody likes to hear that somebody wants to go with somebody else, and I probably wouldn’t either,” McClain admits. The breakup of the partnership has been fairly public. “Divided They Stand” was the subject line of the Dish newsletter from Chicago magazine announcing the split; in contrast to a usually discreet process, Spring’s sale was announced on WBEZ’s Vocalo blog, with Drohomyrecky using the word contentious twice to describe the tenor of the discussions over the dissolution of the partnership. “It was a well-intentioned separation that unfortunately just got mired in details,” McClain says carefully of the expensive and protracted legal dispute. “As with all things,” the chef explains, even the “best intentions” can get muddled: “It’s never quite even, and all of a sudden, whether it’s an accusation or someone’s feelings get hurt, that’s when people don’t communicate…. [Then] all of a sudden you realize you haven’t talked in three months or six months and you don’t know how to bridge that gap. And then you ask for advice from third parties, and it’s really hard to talk through third parties.” At stake: What are the three restaurants worth, and how can three assets be fairly divided two ways? “Simplicity is very deceptive,” says Kim-Drohomyrecky. She and Drohomyrecky face each other as I interview them at a corner table at Custom House Tavern, and she’s describing a short-rib preparation the new chef, Perry Hendrix, has added to the menu. Drohomyrecky is wearing boat shoes, is sockless and vacillates between silence and lyrical pontificating: “When you have an environment like a restaurant, you get the sense that you’re stuck under an umbrella in the storm of the night, and it really makes a difference if people like each other.” Kim-Drohomyrecky does most of the talking. (At one point, she lightheartedly tells Drohomyrecky to stop before he gets quoted: He had begun to say that he likes their restaurants best before they open—that “customers just end up scuffing up the furniture.”) After Camarota left, the couple brought on Aaron Deal as the chef. In May, they fired him, telling Chicago magazine that “we couldn’t get Aaron to deliver a menu that matched our concept.” (Deal declined to elaborate on the situation; he’s currently seeking employment.) With Hendrix—then in St. Louis—on board to start at Custom House Tavern at the end of summer, the owners brought on Eric Aubriot, a friend of theirs and a veteran of Le Français and Aubriot, for the interim. Why not keep Deal on until Hendrix’s arrival? “If we had kept Aaron here longer, it would have gone further away from where we wanted it to go,” Drohomyrecky says, possibly making it harder to bring diners back once Hendrix arrived. After the tumultuous year, both parties approached interviews for this story skeptically: When I initially asked Drohomyrecky to talk about Spring, Green Zebra and Custom House Tavern, he responded that he would not comment on the former two, then got off the phone before an interview could be scheduled. (A phone call and e-mail the following day yielded a return call from Kim-Drohomyrecky and an interview with the couple the day after.) McClain, for his part, requested after two interviews—one in Chicago and one in Las Vegas—that I not sabotage him. Plays and art exhibits are scheduled to close. A movie is considered a hit if it lasts a few months at the box office. Bands fade in and out of relevance. The play was well-attended, the album sold: The artist is successful. But when restaurants—the current cultural fixation—say they’re closing, the air of failure can’t help but attach itself to the announcement. There is a sense that it could have been prevented, that mistakes were made. Pageview-driven sorrow reverberates across the blogwaves. The next day, everyone has moved on. After all, there is a reason restaurants close. In Spring’s case, there will be many. “We could even go back to the opening of Japonais,” McClain begins. “I swear to God, it coincided somewhere with the North Avenue bridge construction,” says Kim-Drohomyrecky. Concierge referrals tapered off. Focus shifted to the new and next. When the recession hit in late 2008, it altered the way people dined. But McClain seems to come back, time and again, to Spring’s location. “We started looking like an island out here,” he says. 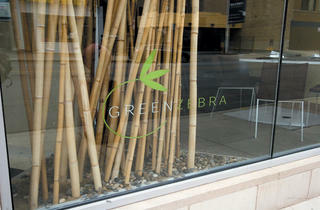 “We had hoped that this neighborhood would grow up around us, and yes, it has. You see Marc Jacobs and super high-rent retail, but the restaurant scene never really evolved here. There are some great local places, but no [other fine-dining restaurants] really followed us out here, and that kind of hurt us, too.” McClain mentions the neighborhood’s thriving bar scene: “Good or bad, it’s not our clientele.” Drohomyrecky doesn’t think the location has much to do with it. “It was the times that changed,” he says. “In 2001, we had far less competition.” Blackbird, mk, Naha. The Drohomyreckys are stoic about Spring’s closing and speak in carefully evasive phrases about the conflict between them and the chef. McClain talks about the closing with a mixture of sadness and resignation: “It’s heartbreaking in a way. But in a way, as a lot of my peers tell me—especially older chefs—everything has life cycles. The worst thing to do is to hang on to something too long.” A few days before our meeting, the sale had almost closed, before an investor dropped out. The partnership dispute weighs on the chef. But so, perhaps, does being Shawn McClain. A month later. Happy Hour at Sage is unwinding. The $14 cocktails at the gorgeous marble bar are no longer $7, and a thirtysomething man in a sports coat is getting up to leave. The din of high-stakes poker and slot machines beckons from the lobby. “So who is…Shawn—?” he asks the bartender. “Shawn McClain,” the bartender completes the question. “He’s a chef from Chicago. He has three restaurants there.” No one at Sage would care that he has nothing to do with one of them and that another is on the market. Definitely not the craggy older gentleman who just sat down at a lounge table with two young women displaying the maximum allowable surface area of their breasts. 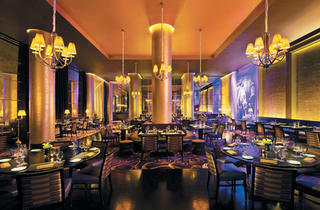 Sage’s moment in the Vegas spotlight stands in contrast to McClain’s restaurants in Chicago. Though Spring’s food remains stunning and contemporary, the restaurant has slipped from the food-scene radar. Zebra continues to fill an important niche, but without a publicist or social media, it receives little attention from the local press. McClain thought opening a successful place in a monumental real-estate project would bring more attention to his restaurants here: It hasn’t happened yet. Instead, some in the food world mistakenly assume the chef is rarely in Chicago: When I e-mailed McClain to request an interview, I was surprised when the caller ID that appeared on my phone five minutes later was Spring Restaurant. During Sage’s first few months (it opened in December 2009), McClain, his wife, Holly, and their two-year-old daughter rented a house there. By May, McClain was commuting from Las Vegas to Chicago every week—three days here, four days there. Now he plans to visit Sage every couple of weeks. But even when he’s not in Chicago, his influence can be measured by the talented chefs who trained in his kitchens and are now at the helm of their own restaurants: The list includes Stephanie Izard, chef-owner of Girl and the Goat, and her current sous chef, Jan Rickerl; David Dworshak, who was recently appointed executive chef at Carnivale; Nick Lacasse of the Drawing Room; Top Chef competitors Valerie Bolon and Dale Talde; and Michael Bulkowski, the chef-owner of Revolver in Findlay, Ohio. Perhaps it’s this polarized turn of events that leaves McClain cautious about the future. “It’s going to be a hard couple years to kind of start over,” he says. Will he open another restaurant in Chicago? 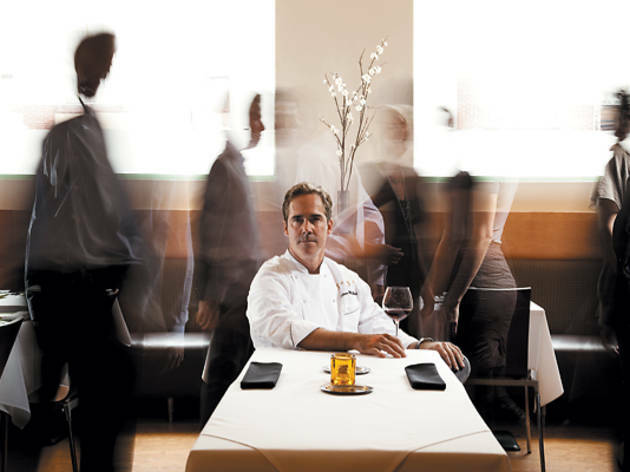 “It’ll be a couple years, for sure.” Does he want to be the next Jean-Georges? “How he does it as well as he does it is amazing. I don’t think I have the capacity.” His hesitation stands in high contrast to his soon-to-be-former partners, who are actively looking for spaces for two projects, one with Aubriot and a second with Hendrix, who arrived at Custom House Tavern in early August. “We’re in a good place,” Kim-Drohomyrecky says. “I found my energy again.” Speaking about the economy, Drohomyrecky thinks “the ice is cracking.” The couple’s optimism about Chicago dining can be read as either refreshing or aloof. The kitchen at Sage is quiet and focused like a yoga class: Plates of artful heirloom tomatoes and precious reinventions of s’mores arrive at an even pace on the line in front of where McClain and I are standing. I’m telling him about the server I had at Spring the previous week, when he was not in the restaurant. When we had spoken a few weeks before at the coffee shop in Bucktown, McClain had mentioned possibly adapting the restaurant if it didn’t sell, so I am surprised by his solemn reply. “I wish I had taken a Polaroid of every person who’s worked for me at Spring,” he says, notes of pride and sadness in his voice. He doesn’t look at me as he speaks: He’s watching as plates on the hot line move toward the expediter. A server interrupts to inform him of a VIP in the dining room. He walks me back through the restaurant, his pace measured, his posture upright. Around 12:30am, his night at Sage will end. He’ll walk past the card tables and up to his room in the hotel. He’ll sleep. In a few days, he’ll fly back to Chicago, where his wife is expecting their second child, due in five weeks.